Buy Quality & Buy Direct! At Waldrop Manufacturing we’re dedicated to constant improvement. 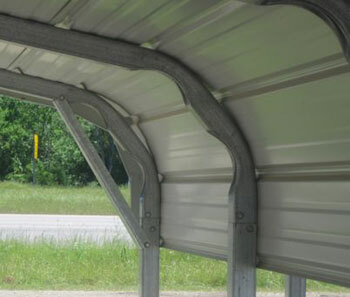 This page will address particular components of our metal buildings and steel carports and why we make them the way we do. Wherever possible, we included pictures for greater illustration. To say we know steel panels would be an understatement. We know them well and we want you to know that we use only steel panels with minimum yield strength of 80,000 pounds or 40 tons of pressure per square inch. That means the steel used on the exterior of our Alabama metal buildings and steel carports can withstand that kind of pressure before "going plastic" or "yielding". We also deliver the best protective paint system on those panels and we invite you to learn more about that at our Available Colors page. There you can also read the terms of the 40 year paint warranty against fading, chalking or peeling. There is a reason our metal buildings and steel carports are in use by thousands of private and commercial customers. The reason is simple - we meet or exceed their specifications. Our steel is tested and proven to be stronger and more corrosive resistant than any other steel on the market. We use 65,000 psi minimum yield strength steel in all our metal buildings in Alabama. The competition uses a maximum of 50,000 psi steel. In many cases you have no idea what strength the steel is because it’s from Mexico or China where they are not required to meet any strength criteria. 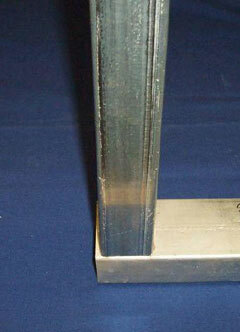 The base rail system can be damaged by any water or condensation occurring at the bottom. We use rugged 14 gauge steel pins or inserts at the bottom because these thicker, consistent connections bear the weight of the structure better than machined or formed parts. All the upright vertical insert pieces are 12” tall which gives more flexibility in adjusting to any onsite irregularities in your land. Uncompromised steel is the best way to achieve that. The connection at the base rails needs a very consistent fit. Sometimes two or more people are needed to lift the frame system and then lay it down over the insert or pin. If it didn’t go on easily and still fit like a glove, you might be very upset with us. Side Walls - An easier assembly and a stronger wall. It is obvious that a single piece sidewall is going to be stronger than one that uses multiple pieces. Fewer connections joined together make for fewer man hours during assembly. 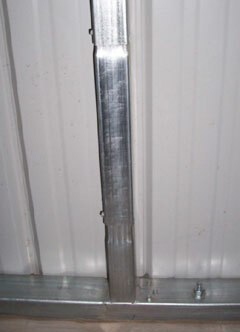 This achieves a perfectly straight wall that can easily be adjusted in the field if necessary. parts make for harder installation. Many people know that steel is made stronger with curves and angles. Think of the body of your car; if it did not have those contours and angles, the car body would not be as strong as it is. 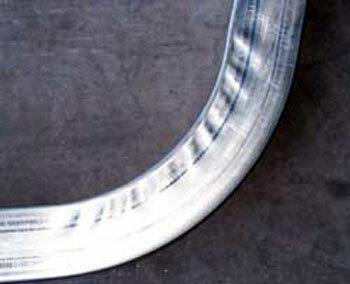 We apply the same principle to our bending process in order to ensure strength. We fabricate the Power Bend for our metal buildings and steel carports by a process which adds six more surfaces/angles to the bend. Therefore, instead of weakening the steel, we strengthen it. This is the worst technique. It weakens the steel precisely where it should not. As a side note—look at the joints; they only used one screw on each side. That kind of laziness will result in someone getting hurt! 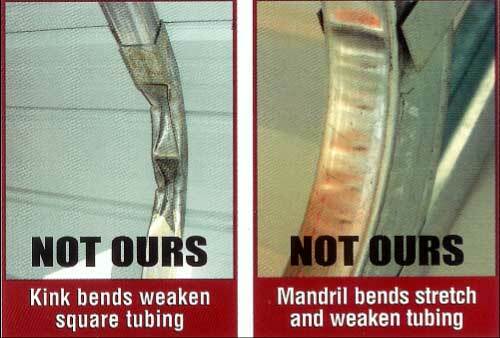 The company that produces this makes the claim "smooth mandrel bend for a cleaner look and stronger bend transition”. We beg to differ. You can’t stretch metal and make it stronger. See the stress marks on the tube where its been stretched? Those are now severely weakened areas exactly where you don’t want them. 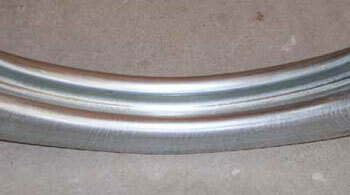 The Power Bend is a result of rolling the excess steel while the curvature is created. The rolled edging now gives strength to the transition curve. Not only do we have the original integrity of the steel intact, we have added strength and durability.